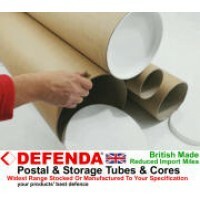 Defenda A0 poster tubes are ideal for ensuring your A0 documents, posters, maps, drawings or plans pass undamaged through the postal service or by courier. You have various options to choose from in our A0 mailing tubes with options for 50mm diameter, 76mm diameter & even an 8” diameter A0 or AO length tube. 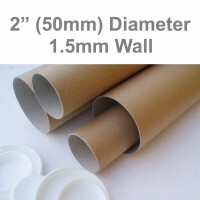 Tubes for A0 sized items range from 34.5” & 35” with 37” tubes also being used where additional space at the ends of an item is desired. 2" Diameter (A0 Size) Postal Tubes 34.5” Long - 875mm Long x 50mm Diameter﻿Strong A0 Size cardboa..
2” Diameter A0 Heavy Duty Postal Tubes 30” Long - 762mm Long x 50mm Diameter﻿ with an Extra ..
3” Diameter A0+ Postal Tubes 35” Long - 889mm Long x 76mm Diameter﻿Strong cardboard A0 size Postal T..